Cast Of A Bone Fishhook From Cahokia Mounds. This bone fishhook was found several years ago on the Cahokia Mounds Historic site. It was discovered during the excavation of the stockade wall. It appears to be made of deer bone and possibly from the toe bone of a deer. An estimated date for this fishhook is somewhere between A.D. 900 to A.D. 1300. Fishhooks have been found on Mississippi, Woodland and Archaic sites. 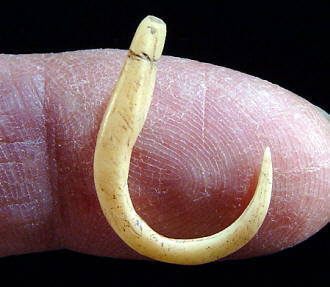 Bone fishhooks 8,000 to 9,000 years old were found in Nebraska (Wormington, 1957: 138). To the Mississippian people, fish were an extremely important source for concentrated protein. The bones from several different varieties of fish such as flathead catfish, alligator gar, drum buffalo, largemouth bass, walleye, channel catfish, bowfin, gar and suckers are found in abundance on many Mississippian village sites. Fishing techniques varied greatly just as they do today. The use of nets in pools left by receding floodwater would account for large and easy catches. The use of harpoons, hooks and gorges would produce much lower volumes of fish. The paucity of fishhooks on Mississippian sites suggests angling was of relatively little economic importance. Most fishhooks were probably used on trot lines rather than the single lines and poles we use today.